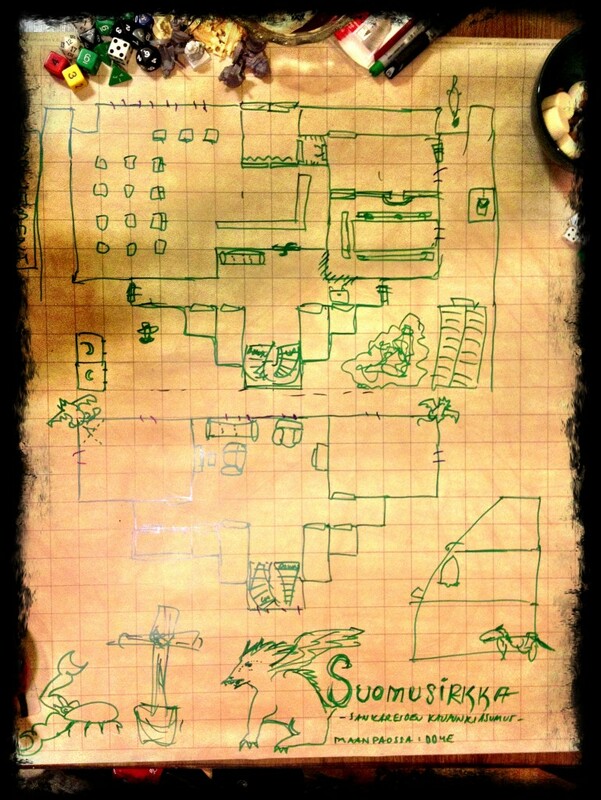 We’ve been playing the same Dungeons & Dragons (fourth edition) campaign for over two years now. Twenty-four games, ten players, levels one through eight. The goal was always to play all the way up to level ten, bookending the first “tier” of play, and now, with the second season concluded successfully, it feels like we’ll make it for sure. The one thing that makes our D&D game special and unlikely – at least by the standards I’m used to – is that we have seven steady players. In most of our games, it’s the full seven players present, plus myself running the show. I never thought it could work, but I couldn’t bear to deny anyone entry, so we decided to give it a shot. And what do you know, it works so well that I would be uncomfortable running the game for, say, just four players, which used to be my sweet spot. But having this many players at the table means a couple of things, which I’m going to dive into here. Something that can be hard to plan for is the interpersonal chemistry at the table. That doesn’t mean you shouldn’t do it! But in a game this big, it requires extra thought because any conflict or friction is going to quickly escalate. I have spent quite a bit of time thinking about it, optimizing who’s playing who, who’s sitting with whom and just generally who we invite. I am super happy with our chemistry. Missing anyone in a given game means we have a skewed dynamic. There’s a sense of loss. You might think that this is a problem, because when are you going to have eight people available for every game, roughly every other week? But at least in our case, everybody makes the time and people generally very rarely miss games. Probably it all being so unlikely brings a sort of gravitas to the proceedings. One detail I’ve been wondering about is whether our gender balance changes this in some way – we have usually a 50-50 gender mix or leaning by one in one direction. I have not reached a conclusion on that, but if anything, it helps. The game’s logistics are somewhat demanding. Just having the room for eight people can be a problem. The amount of game you can fit into a single night is surprising – in how little it is. The seven players talking among themselves takes a lot of time. I can generally manage 1-3 roleplaying scenes, with 1-2 fights. We like to eat before or during the game and if we’re cooking for the whole group, you better pencil in that whole day just for preparing food. Also normal campaign upkeep like levelling characters and printing sheets is something you need to set aside time for. Running a combat with seven players plus a familiar and a roughly equal number of worthy enemies is a lot of work. My players like to take command of the battle mat, and I’m benefitting from that, having them track both initiatives and hit points for the entire cast, including their foes. It also helps the players focus on the game. The number of players and their abilities means that most mechanical challenges are pushovers, no matter what the numbers say. I’ve upped the difficulty level all through the campaign to make it challenging enough, and it’s still tough hitting that sweet spot. My advice would be to go overboard rather than shy away from pushing them – the players have so many tricks up their sleeves in 4E it’s very difficult to actually hurt them in the long-term. This works the same way in fights. The recommended numbers in Challenge Rating do not apply at all – I’m routinely overshooting by over a third to create situations the players will find fun and challenging. D&D combat is best when a number of characters are in genuine danger of dying and it’s the gamemaster’s job to provide that. The biggest issue is storytelling. While we’ve talked about character development, internal conflicts and so forth at the table, it’s just hard to come by any sort of meaningful drama in such a big group. A couple of sessions ago I introduced a mechanical solution. Every time the players rest – basically sitting down in camp – one of the players is required to develop their character. Like in Mountain Witch, the story doesn’t advance until someone progresses their personal story. Of course this requires that all of their characters actually have compelling conflicts and built-in drama that just needs an outlet. In practice, the players are instructed to either set a scene and welcome the other players to resolve it for them, or vice versa – exactly as in Fiasco. Others can jump in, and almost automatically relationships deepen and take sudden turns. Even though the “drama turn” revolves around the group, and it’s artificial in that way, so far it’s worked admirably. I think most games could use a mechanic like this, especially when in big groups where it may be difficult to find the time in the spotlight and loud players automatically get all the attention. I’m going to run some smaller games on our D&D break during the summer. We’ll see if there’s cross-pollination in one direction or the other – I fully expect some insights! I just started running a campaign for seven people, and I stumbled across this. Thanks so much for some insight on what I have to look forwards to!